Hey everyone. My name is John Orgel and I live in Charleston, SC. I’ve been playing for only two years, and I’ve seen my playing skill exponentially increase in just a short amount of time thanks in part to SixPrizes, but also due to the great players that I have gotten to know and befriend in my short time playing the game. I recently attended two States: North Carolina and Maryland. I went 4-3 in North Carolina and 7-0 in Swiss in Maryland before winning the tournament. I hope to write a tournament report later (feel free to post questions you want answered below), but today I want to focus on the deck that I played at each event: Plasma Klinklang. For some reason the Pokémon community has cast out Klinklang as being too clunky or not powerful enough to keep up in this fast-paced format. Most have relegated it to Tier 2 status and have kept it out of the conversation of viable decks for States. While I agree that this deck does not have speed and doesn’t hit for very much (a Steel Bullet for Cobalion EX for 100 damage usually being your max), any player that dismissed the deck on these two components alone is totally overlooking some of the factors that make this deck so good. Most of us are familiar with the original Klinklang variant that John Roberts II piloted all the way to a victory in the 2012 National Championships. This deck succeeded even as recently as this year’s Cities because it was able to utilize attackers like Terrakion NVI, Rayquaza DRV, Keldeo EX, and Landorous EX to hit decks for Weakness. It was the versatility (being able to swap out your attackers for different metagames) that made Klinklang BLW such a good deck. 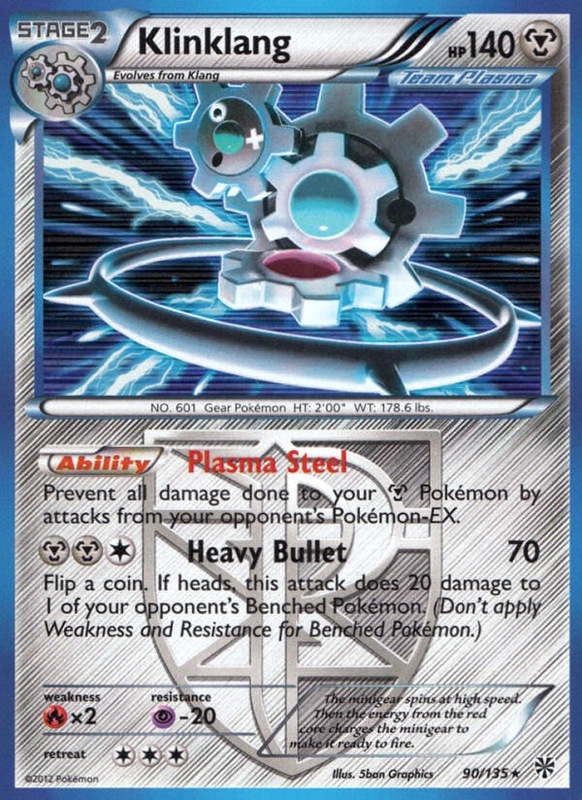 Now we are presented with a new Klinklang with the Ability Plasma Steel that “prevents all damage done to your Metal Pokémon by your opponent’s Pokémon EX” and in turn a new question: How do I make the best deck possible that is able to utilize this new Ability yet keep the spirit of what made Klinklang good in the first place? If you read all that you may be scratching your head a little. Well, let me explain. I set out to make a deck that took advantage of Klinklang’s strengths while working around its weaknesses. In addition, I wanted to make a deck that made getting out both Klinklangs a priority. Plasma Klinklang plays a lot like a Vileplume UD lock deck where, once you are set up, your opponent can do little more that draw and pass until you win. This type of deck was popular near the end of the last format and would use cards like Accelgor DEX or Mew Prime, Vanilluxe NVI, and Unfeasant BLW to lock your opponent into a state where they could do nothing to hurt you. 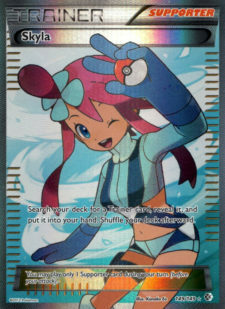 Pokemon ParadijsThe Supporter line of 8 draw Supporters and 4 Skyla (search Supporters) may seem less than the typical amount, but this deck is slower than normal and does not need the large amount of straight draw that Darkrai or Eels benefit from. In addition, the inclusion of Tropical Beach allows the player to wall with Cobalion EX and get set up without the use of Supporters, saving them for the crucial mid and late game. Running 4 Sklya is important in getting Tropical Beach in play as soon as possible and ensuring that you are able to evolve into Klinklang at a rapid pace. In this way Klinklang reminds me of Blastoise in that it benefits from an early set up. Unlike Blastoise, this deck does not explode into action but kind of needs a few turns to attach energy and cannot hit for an unlimited amount of damage. On the flip side, where Blastoise struggles, and usually loses, if it doesn’t get set up in the first few turns, Klinklang can flounder around early game and still find a way to win late game. Your opponent can Catcher and kill every Klink you put in play, but all it takes is one Super Rod and you’re back in the game (and your opponent is out of Catchers). The three Heavy Balls and only one Ultra Ball are something unique to this deck and something that I wouldn’t run in any other archetype. It makes getting your Klinklangs out a priority and attacking a secondary objective. My logic behind this is that you will draw into one of your Cobalion EX and can Shift Gear the energy necessary to attack once you do get them out. Four Max Potions and one Pokémon Center help heal your Pokémon and can keep the game going way past what you and your opponent think is possible. Once Plasma Steel is in effect your opponent can no longer one-shot your Pokémon as there are no non-EX attackers that will one-shot your main attacker Cobalion EX (barring Fire attackers and a massive blastoise, but I didn’t forget about those guys). Using the Max Potion and Shift Gear combo you can keep damage off the field and, ultimately demoralize your opponent. This strategy allows your opponent to get out to an early Prize lead while you rest on the knowledge that they will not be able to do anything late game. I’ve had many games in which my opponent was able to take 4 Prizes before I set up my Plasma Klinklang, but as soon as I did they never took another Prize the rest of the game as I either went on to take 6 of my own or deck them out. Five cards to get your Pokémon out of the Active position seems excessive, but trust me, it’s not. One of the most popular strategies is to Catcher up your Plasma Klinklang and Laser/swing into it with a non-EX attacker. Making sure that you have the Switch (and the Max Potion) to counter this strategy is crucial to this deck’s success. Escape Rope started off as a joke one-of, but it has the ability to win you games if your opponent tries to wall with a big EX Pokémon at the end of the game, almost acting like an extra Pokémon Catcher in this deck. Pokémon Center and Tropical Beach are not just there to look pretty, but also play an important role in discarding your opponent’s Virbank City Gyms. Lasers are one of this deck’s biggest hurdles, but when Lasers only hit for the regular amount of Poison damage, they hurt a lot less. When it comes to handling most decks, Plasma Klinklang paired with the Shift Gear Klinklang and Max Potion combo gives you such an advantage that it can be hard for your opponent to overcome. That being said, there are a few Fire Pokémon counters that can give Klinklang a really bad day. If you want to play this deck in a high level tournament, you need to be prepared to play against and deal with all of these counters. Pokemon ParadijsThis is Plasma Klinklang’s worst nightmare. I have spent hours and hours agonizing and scheming of ways to beat it. This one card paired with two Super Rods takes RayEels from an auto-win for Klinklang to (almost) an auto-loss. I hesitate to call anything an auto-loss as there is always an element of chance in Pokémon, but this is as close as KK has to an auto-loss. The best strategy is to get early Energy attachments and spread them out amongst your Pokémon. Wait for your opponent to drop their Victini, do not start attacking with a 3 Energy Cobalion EX, and instead use its first attack to just apply some pressure or don’t attack at all – just focus on getting an Energy attachment each turn and getting multiple Klinks into play. In addition to spreading your Energy, Catcher up Eels or other high-energy attackers (like Rayquaza if they are foolish enough to drop him), and bump your opponent’s Skyarrow Bridge with your own Stadiums. When your opponent does take that first Prize with Victini, it is important to not freak out. Instead get the Shift Gear Klinklang into play and move your Energy to a new attacker, promote the new attacker, and knock out their Victini. Once you have knocked out their Victini they will try to get it back out. Make sure that you save your Catchers for Victini and that you keep your Energy spread out. It is important to keep Plasma Klinklang on the field, but not as important as your Energy drops. Usually there will be a one or two turn delay between the times you are attacked by Victini, allowing you to get the Plasma Klinklang in play to shut off their Rayquaza EX. Some techs that you can include in the “Tech Trainer” spot listed above are Exp. Share to keep Energy on the field or, what I included in my States list, a Hypnotoxic Laser. With Hypnotoxic Laser you can use Cobalion NVI’s Energy Press attack and Laser to knock out your opponent’s Victini. 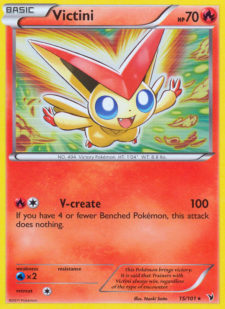 Laser also has uses beyond KOing Victini and can use your opponent’s Stadium against them when Virbank is in play. This deck does not hit for “magic numbers” (see Esa’s article) like Darkrai or Landorus do, but with Laser it is possible to get a 2HKO on an EX with the NVI Cobalion. In comparison with Victini NVI, other attackers like Reshiram BLW or Moltres NXD are much harder to get into play and much more inefficient. A good player can play around these guys and shouldn’t sweat seeing them pop up in a Blastoise or Darkrai deck. The key against Reshiram is to not hit into it too hard, just use Cobalion EX’s Righteous Edge to do 30 and finish it off next turn with a Steel Bullet. Moltres is a bit harder to KO, but is really hard for a Blastoise player to use more than once in a game. If you do face one, an Iron Breaker with Cobalion NVI is usually the best mode of attack. 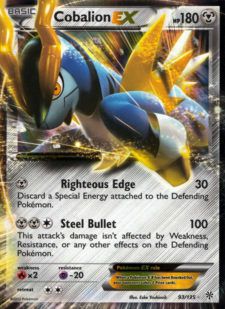 If you do play Registeel EX, you can also Protect Charge to prevent a knock out from this Fire legendary. 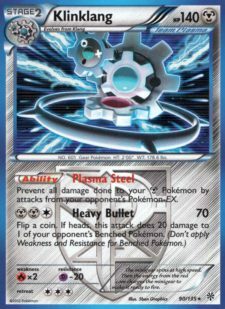 Pokemon ParadijsBouffalant DRX is usually a hassle for most decks, but since Steel Bullet cuts through all “Weakness, Resistance, or any other effects on the Defending Pokémon,” you are going to one-shot the scary buffalo. The hardest non-EX attackers you will go up against are Terrakion NVI, Empoleon DEX, and Blastoise BCR. Against Terrakion use Iron Breaker or switch between Cobalion EXs and heal with Pokémon Center. Empoleon decks often run high counts of Blend WLFM and low counts of Water Energy. I suggest using Cobalion EX’s first attack to discard the Special Energy. If they have one of their few Waters attached, keep using your Max Potions and eventually you will knock it out. I’ve found that once you remove all of an Empoleon deck’s Special Energy they have a really hard time attacking and you can deck them out. Blastoise is also a favorable opponent. The key is to make sure to save your Cobalion NVI to Energy Press if their Stoise has six or more Energy on it. If they don’t attach more than 5, use Cobalion EX’s Steel Bullet to two-shot the turtle. A Blastoise/Keldeo deck is not well equipped to attacked with Blastoise as this puts their Energy accelerator into the line of fire and takes a large amount of resources to do damage. Your hardest challenge is going to be a Garbodor DRX deck that shuts down your Plasma Steel and Shift Gear Abilities. Both of these Abilities are crucial to this deck’s success, and without them the deck soon becomes a pile of scrap metal. 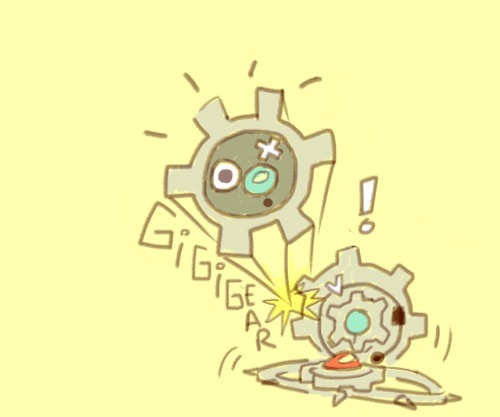 If you are in an area that is running a ton of Garbodor, then do not hesitate to fill that tech spot with a Tool Scrapper (something you can get back with Dowsing Machine if you need to) and make sure to scrap the Tools off of Garbodor at key times, like when you are able to shift the Energy off your attacker and Max Potion. Also, go after their Garbodors, especially if you have just scrapped their Rescue Scarf. If you KO their Garbodor without a Rescue Scarf on it, they will have a hard time getting another one into play. astroaniki.tumblr.comI hope I was able to give you a new perspective on Plasma Klinklang, if not convince you that Klinklang should sit at the adult tables and is something to be feared. Klinklang is very meta dependent and would not be a good choice for a metagame that is full of RayEels and Garbodor as these matchups are highly unfavorable. The reason that I went 4-3 in NC and 7-0 in MD is because the metagames were completely different from week to week and location to location. In the first week my losses were against two RayEels decks and a deck that ran 4 Terrakions with Exp. Share, whereas in MD I did not play against a RayEels or Garbodor deck all day. So the best thing you can do if you want to play Klinklang this last week of States is to do your homework and come prepared with a backup deck. Quite a bold choice to play Klinklang after all the reports of Garbodor in week one states. Good writeup and congrats on the successful meta call and win! KlingKlang has always been a point of fear for me. But I’d like to know your thoughts on KlingKlang countering Ninetails. I played against a couple KilngKlang decks last week at NH states and used Ninetails to pretty much sweep them. Just curious to know what a KlingKlang player could do about Ninetails since I’m actually considering the deck for a later tournament. Great article. Playing with you vs the Kingklang, being that I dont tech against it I find that I can get up Blastoise to KO something but after that and after the Blastoise is gone even if I have a second one out there’s just not enough energy to keep going. It’s funny you talked about techs since I made my own KK deck and found that I went 50/50 against myself then I teched in reshiram and found out how bad it was. Since we’ve practiced and I made my own deck I’ve never doubted the power of KK. Once again congrats and I’ll see you tomorrow. I think I played you in round 7 at NC states with my Darkrai and lost. 1) Moltres is a lot easier to set up with blastoise than you give credit too, and can reuse them with a tech basic fire energy and their 4 retrievals. 2) Not sure what empoleon decks you play against, but the ones I know of don’t play “low counts of water energy”, and even if they do, play super rod to recover them anyway. Plasmaklang often has large benches, so empoleon usually has a field day against it. Moltres inefficiant ? On which planet do you play klinklang? I play it in my blastoise and I have a machup of 90-10 against kk. Attaching 3 water energy in one turn on moltres is not a big deal as it is the purpose of the deck. Then I attach prism for a one shot, or a single basic fire that I take back with energy retrival that I play four time. You cant even keep your energies because I catcher you and kill your attackers before they even have a chance to strike 100. And you kill moltres ? Sure no problem, super rod and I finish the game. My opinions is that kk is a deck that has no strategy and requires no skill. You just have to br lucky to not lose first riunfs to pokedads and noobs playing heatmore, reshiboar or empoleon. Then sou have to be livky to play against players that did not trained the matchup or teched their decks. How a deckthat is compeltly shutdown by single victinis moltres or else is a decent deck? This is just my opinion, but if you know how to play this matchup, you don’t have a huge amount of trouble against it. The Darkrai/Hammers/Lasers deck that I run has a fairly good matchup against it, as almost all lists have zero energy acceleration, and 30 damage for a righteous edge won’t cut it against a fully loaded Darkrai after I laser/hammerspam your kk’s into oblivion. Also, if I can outspeed you, i can just target your klinks, and make it so that you have to use up your super rod to get some back into your deck so that you can keep the wall up. However, the main problem is that if I draw dead, I have no chance. This is just my opinion though. What is it with KK players named John winning a bunch of tourneys! haha LOL! Great article though! Thanks (almost everyone) for the positive feedback. @Bria Boyce: I think Ninetales is actually a great counter to Klinklang and a much better route than trying to fit in the V-Create Victini into a darkrai deck or a big basic deck. The best advice is to have a back up Klink or Klang on the bench that you can evolve into once one of your Klinklangs is knocked out. Also, (assuming that you know your opponent runs this counter) save your catchers for when they bench a vulpix and be sure to catcher it up as soon as possible if you are able to knock it out. If they get out a Ninetales early you can still have a shot as they must have laser to “prime” a Klinklang before knocking it out in one hit. @Roarkiller: I don’t think Moltres is a bad counter against Klinklang and if I did give the impression that is was I appologize. I have not seen Moltres in the metagame in the area that I live, but do think that if KK became popular enough a straight varient of Blastoise Keldeo with scoop ups and Moltres could be pretty scary. I just think that Moltres is a mediocre attacker in every other match-up with a high energy cost and low damage output. I think that when a player starts over-teching for different matchups it can start to ruin the consistency of their decks and that Moltres seems to hurt more than it helps, but if you can get it working and working well, and play in an area where you expect a lot of KK, then yes, this is a good tech. @Jack Stensrud: Darkrai hammers is a really hard match-up, but I’ve not really seen the deck too much in the past few State Championships I’ve attended. It really lost a lot of power when Blastoise Keldeo came onto the scene and has a hard match up against a heavy landorous deck. All I can really do is just not attach energies until I have an N in my hand and make sure that I conserve my resources (like super rod) 30 on a Sableye is not a bad start, but it does leave something to be desired. Just keep using max potions and N’ing your opponent and hope that all works out. @rafaelkatsuya: I’ve got nothing to say to you. Klinklang is a metagame call much like any deck is in this rock, paper, scizors format and completely relies upon what you will come up against. If I know I’m going in an area heavy with RayEels and Garbodor I would hesitate to play the deck, but if I’m going to a metagame with Blastoise, Darkrai Lasers and Big Basic (every states these past week) then I’m going to play Klinklang. Also, Klinklang took first in FL this weekend and first and second in Kansas this weekend! I rest my case. Hey, i know this deck has pretty much died (at least here in the Rocky Mountain Area meta) but I’d still like to play it. The only thing in your deck that I’m confused about is Cobalion NVI. Cobalion-EX can hit pretty much anything, including Quad Sygiliph decks, so why run the non-EX?